When the fiftieth anniversary of the October revolution took place in 1967, there were widespread commemorations, many of them at least partially favourable to it. The one-hundredth anniversary, in contrast, was not marked by a huge amount on the left: there were some good events, but they did not attract a mass audience. Mainstream coverage was unremittingly right-wing, claiming that 1917 led to Stalinism and the gulag, so of course must never be repeated. One thing the revolution’s anniversary did do however was to produce a handful of good, engaged books by people sympathetic to the aims of the revolution. This one, by the U.S. socialist and scholar Paul Le Blanc, is in that tradition. The subtitle of the book is Bolshevik Triumph, Communist tragedy, 1917-24 and that sums up the two aspects that are covered; the amazing achievements of the revolution, but at the same time its sometimes horrific degeneration. 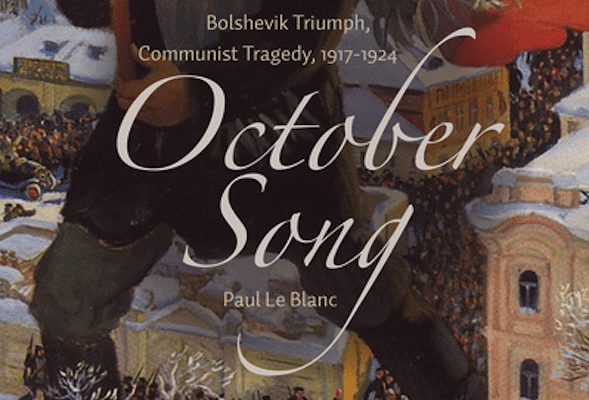 Le Blanc is at pains to describe the rotten society which was Tsarist Russia. The half century before the revolution was one of great change from the emancipation of the serfs in 1861, through the very rapid industrialisation, and the development of a growing working class, through to the experience of the First World War. This exposed the huge social and economic weaknesses of the country, directly leading to the February revolution of 1917, which overthrew the Tsar. By 1917, society could no longer function. The corrupt Tsarist regime was falling apart, the army was facing defeat and mass desertion, and there was growing discontent among workers and the peasantry. The Kerensky government, committed to reforms, was unable to deliver them, and the Bolshevik slogan of ‘bread, peace and land’ summed up the urgent necessities of the hour and ensured the success of the October, soviet, revolution. This in itself was a huge triumph, and one that avoided the right-wing dictatorship threatened by Kornilov. It is generally acknowledged that this could not have happened without the Bolshevik party, a Marxist working-class party which was able to lead the most conscious workers within the soviets. Le Blanc gives them huge credit, and talks about how the party had to deal with issues such as the national question, women’s liberation and the many other complex questions of organising to change society. However, he also is aware of the immediate problems that faced the new soviet government, problems caused by the war, by shortages, then by civil war, famine, and uneven economic development across the country. There were also thousands of issues on which left-wingers themselves, including the Mensheviks and Social Revolutionaries, disagreed or differed in terms of solutions. The international situation appeared promising at the end of the war, as revolution and mass struggle erupted in the defeated European powers and mass industrial unrest in Britain and the U.S. But they were for the most part short lived and were defeated, although they left a legacy of Communist parties everywhere. The Russian Marxists had always believed their backward country with a relatively small working class would have its revolution after those in much more advanced powers such as Germany. Instead they were the first, and increasingly isolated. This led them to some terrible though perhaps inevitable decisions; the treaty of Brest Litovsk in 1918, which ended the war with Germany but at awful cost to Russia, war communism, which saw a weakening of workers’ democracy, a growing bureaucratisation of the party which was now a ruling party, and the partial restoration of private capital through the New Economic Policy of 1921. Le Blanc is very much alive to the dilemmas and concerns of the revolutionary leaders, sometimes critical but always putting their decisions in context. In his chapter ‘Losing Balance’, where he outlines the growing repression and lack of democracy, he quotes the revolutionary Victor Serge as saying that revolution is not the ‘epic festival’ we are promised, but is ‘a storm in which no one is spared, which uproots the strongest, and where the unforeseen triumphs’, and involves what le Blanc calls ‘the good, the bad and the ugly’ in human behaviour (p.219). In looking at all revolutions, we should remember Marx’s adage that we change history but not in conditions of our own choosing, and nowhere was this more so than Russia. Lenin, Trotsky and their supporters inherited a country wrecked by war and famine, with a long history of brutality coursing through society, with peasants and workers only a couple of generations on from their ancestors who were still in serfdom. Le Blanc takes on the arguments about original sin in the revolutionary process leading to dictatorship, and to Stalin, and rejects them. There is nothing inevitable about history, and the people making history are flawed in all sorts of ways by class society and by their own personal circumstances. He takes into account the immediate pre-revolutionary horrors of the war, and the brutalising effect this had on millions. One has only to look at the ex-soldiers of the Freikorps in Germany or the Black and Tans in Ireland under British rule to see the truth of this. He quotes the ‘Pascalian wager’, that it makes more sense to live as though god exists, since if he doesn’t you haven’t lost much by being religious, but if he does you are in trouble if you weren’t. The Marxist gamble on the liberated future, he says, cannot know that it will succeed, but our only hope of winning the wager is to understand that we can’t escape history but must actively engage with it. The revolution, success and failure, is all part of our history, and we must learn from it. As he says, because of what they did, nothing can be the same. This is a hugely well informed and detailed book. Those who want to study the revolution should read it. We may seem a long way from its actuality, and indeed from any socialist revolution, but history is moving very fast again. As with the revolutionaries of that generation, the stakes are very high.